How to find organic food in Beijing ? Some time ago, I made a quick presentation of the Haobao organic farm, delivering south China’s vegetables in Beijing. This initiative is inventive but not that isolated, and this post will further introduce the various ways you can get organic food in Beijing. Some supermarkets in Beijing have organic food departments, this is especially true for foreign chains such as Aeon, Walmart, Carrefour, BHG, Jenny Wang, April Gournet. Lohao city is a franchise of organic groceries stores, these are the places you can go to buy organic food. You have several adresses in Beijing, 6 shops in Chaoyang, 2 in Shunyi. You have all kinds of imported vegetables, from the most « classical » ones to exotic ones that prove hard to find in Beijing with an organic label. For more information, visit their website here. If you have trouble finding them, ask for them to Chinese people around you, the Chinese name is 乐活城. A company that has specialized since 2007 in organic food delivery, with tremendous success all over China. You can order in Beijing. Them again, in addition to their shops, they offer home delivery ? Since everything is in Chinese you might require some help. If your Chinese is good enough, you can see online on more « mainstream » websites such as Taobao to buy organic food, but you’ll probably need help, the offer there is very wide. A growing trend in China is the usage of food communities, that enable you to have food delivered directly from the farm. 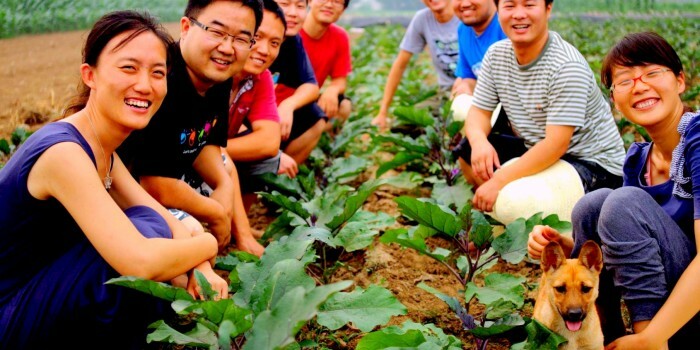 One of the pionneers here is Shared Harvest, that unites a food delivery from a variety of farms around Beijing (farms in Tongzhou and Zhunyi that you can visit, by the way, seeing by yourself how organic things are there), with a growing success. You have many other firect from farm opportunities, but you’ll have to be able to find them on Taobao. Shared Harvest seems so far the most reliable network. You can try as well the Beijing Organic Farm, as an exemple of the many young companies emerging in this area. There is as well a Beijing Farmer Market, with a large organic offer. Is a baby boom coming in China ?